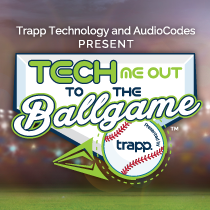 Trapp Technology announces the return of “Tech Me Out to the Ballgame” IT Summit, co-presented by AudioCodes. The highly interactive event will be held on July 15, 2016 in the Legends Suite overlooking the right field of Chase Field in downtown Phoenix, Arizona. The popular event provides a powerful platform for over 250 C-level executives, thought leaders, and decision makers to explore emerging business and technology solutions. Eight breakout sessions, presented by local and national sponsors, are designed to cover the full spectrum of IT, company culture, marketing, and CEO mindset. • Michael B. McCallister, retired CEO of Humana, Inc. Immediately after the IT Summit concludes, Legends Suites C & D will be converted to host dinner, drinks, and the Arizona Diamondbacks vs. Los Angeles Dodgers game, courtesy of Trapp Technology. A silent auction of coveted Arizona Diamondbacks memorabilia will benefit local charities of Arizona. Don’t miss this valuable opportunity to gain executive insight from and network with the Valley’s top influencers! Make sure to follow event updates and real-time coverage on social media by following #TechMeOut16. Tech Me Out to the Ballgame – Second Annual IT Summit is free to attend, RSVP required. For complete agenda and ticket registration visit techmeoutsummit.com or contact Nicole Wheeler, Event Marketing Specialist, at nwheeler@trapptechnology.com.